The Day of the Triffids is an adaptation of John Wyndham's novel of the same name, and it's no surprise to learn that the film is considered far from a faithful recreation, since it somehow manages to make the idea of gigantic murderous monster-plants boring. It takes the premise of carnivorous extraterrestrial vegetation from the book and guts the characterization and plotting to make room for an uninspired caricature of an alcoholic scientist and a rewritten ending so contrived it makes War of the Worlds's look like the paragon of complexity. Here's the problem. One the one hand, Triffids takes such a straight-faced attitude toward its subject matter that it's impossible to laugh at the quaint special effects or the nonsensical character motivations. But on the other hand, it's too aimless and uneventful to really enjoy as a genuine sci-fi thriller. 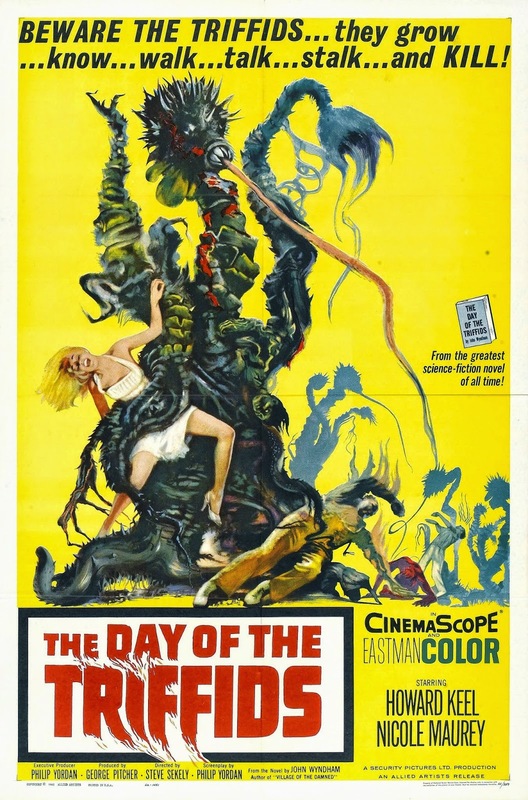 The post-apocalyptic atmosphere in the wake of a meteor shower that blinds 90% of Earth's population is occasionally intriguing (and quite reminiscent of 28 Days Later), but the titular flower monsters only show up when it's convenient for the plot and never pose enough of a threat to really take seriously. I feel bad bashing oldies like this, and generally I really love classic sci-fi movies even when their age begins to show, but Day of the Triffids really doesn't have much going for it. There's one good set piece and some of the performances are serviceable, but otherwise this is a weed I regret to say I wouldn't mind pulling.